Dinners with chicken as the main course. Here’s my goal – get rid of the Kid’s Menu at all restaurants! I propose that all restaurants offer ½ portion meals at ½ price for their child patrons. 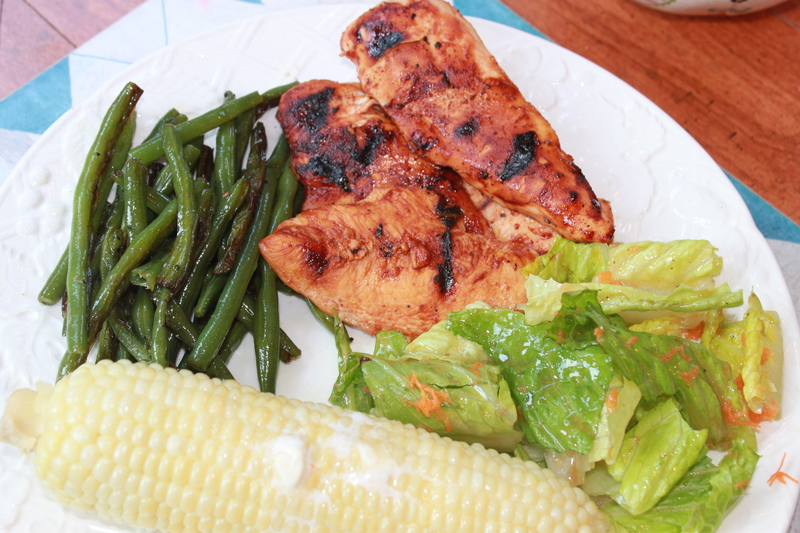 The restaurant could also offer a toddler some pasta or steamed veggies with butter or some grilled chicken. This not only helps your child, it also helps the restaurant build goodwill with their customers. Don’t be afraid to ask your waiter to make something simple for your kids even if they do have a kid’s menu. 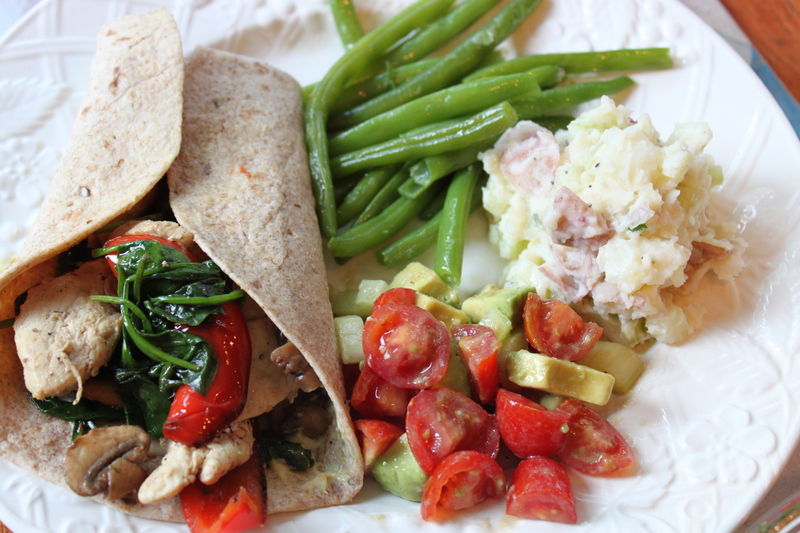 This is so easy if your children are accustomed to fresh, simply prepared food at home. I love the fact that my kids love the same restaurants we do. Why limit yourself to TGIFridays when you could go to your favorite Italian or Sushi place! Boil a package of gluten-free udon noodles in salted water. Sautee 2 cloves of garlic and 2 shallots in EV Olive oil until clear. Optional: pour about ½ cup of white wine and scrape the pan – let cook off for 2 mins. Add chopped veggies and a splash of chicken broth. Cover a cook for 8-10 mins. until tender. Add some salt/pepper and herbs (I chopped some parsley, basil, rosemary/thyme) – fresh or a dash of dried. Drain the pasta (save some liquid) and pour the veggies in the pasta pot. Cut up the chicken and add salt/pepper. Cook chicken on Med/High in same pan used to cook veggies. Turn and continue cooking until no longer pink in center about 6-7 mins. Add a little chicken broth and scrape bottom. Pour the pasta and veggies into the chicken and stir. Add a little pasta liquid or chicken broth to thicken. Top with some grated cheese. *Note: For the pasta, I used flat brown rice Udon noodles. The kids loved it (so did we)! Dinner-time comes at roughly the same time each night – so can you tell me why there are some nights we look at the clock in complete and utter shock, “Oh my god! It’s dinner-time, what are we going to do?!?”. Imagine waking up one day, “Oh no! It’s Christmas Eve and I haven’t bought a single present!”. The shock of dinner-time sneaks up on all of us and it happened to me tonight. So I looked in my freezer and whipped this up with just a few ingredients in just 15 (not 30) minutes. I guarantee it was faster than chicken nuggets and mac n’ cheese and required the same number of dishes. I just wish I could get the same amazing results with 3 Minute Abs. Cook ¾ box of gluten-free Pasta (add lots of salt to the water). Reserve about 1/2 cup of pasta water. Take the meat out of the casing of 4 Italian Chicken Sausages (I only had 3 so I cut up a single chicken breast and added it in). Fry the sausage/chicken breaking into small pieces until it is cooked through. 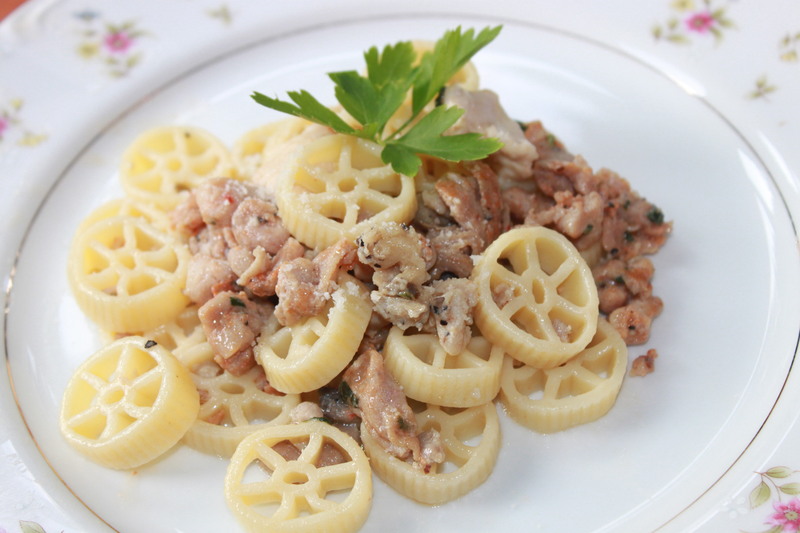 Add meat to pot with cooked pasta. Add about ½ cup of pasta water and ¼ cup of parmesan cheese (fresh basil if you have it). Stir and serve! 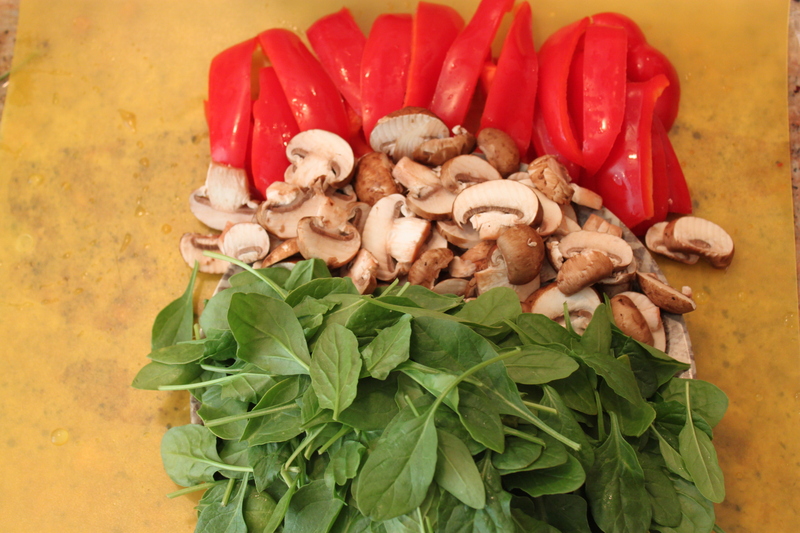 Note: You can cook some veggies with the meat (e.g., mushrooms, peppers, tomatoes). Add salt/pepper and herbs to taste (e.g., parsley, basil). The flavor from organic Italian sausage alone was amazing! The family meal helps pre-schoolers develop better language skills (they may hear different words used at the table than they heard during the day). The link between processed foods and cancer is being proven more every day. Create Food Flexibility in your Family! Life is so much easier when everyone eats the same healthy meal. Mia told me tonight that I was “getting a little carried away with the grilling” and suggested that I go back to cooking food in the pan or oven. To add insult to injury, she also informed me that her dad was actually a better griller than I am – which is fine with me. You see, Mike’s grilling skills are actually one of the reasons we have such a good marriage. When we were dating, we ate dinner at my parent’s house a lot. My father would be grilling and my mother would be yelling instructions out the door “Flip the steaks now!”. It was then and there after dating only a few months that I turned to Mike and told him that if we were ever going to be married someday that he would have to become a “Grill Master”. Well, Mike’s grilling skills have reached perfection and here we are 16 years later happily married. But, looking back on those wonderful dinners with my parents, I can’t help but think the same thing over and over…..WHY didn’t I say, “Laundry Master”? Grilled Chicken Cutlets: Tonight’s dinner took 10 minutes to cook. Took about 10 thin, small chicken cutlets and marinated them in a Ziploc bag with Fresh Market’s Anytime Marinade (it tastes like a mild BBQ sauce with only 6 ingredients). Grill chicken on a piece of tin foil for 5 minutes on High. Flip chicken and cook for an additional 5 minutes on Medium. Snap ends off fresh string beans and lay on a piece of tin foil. Toss with a little EV olive oil, ginger (powder), salt/pepper and 2 garlic cloves. 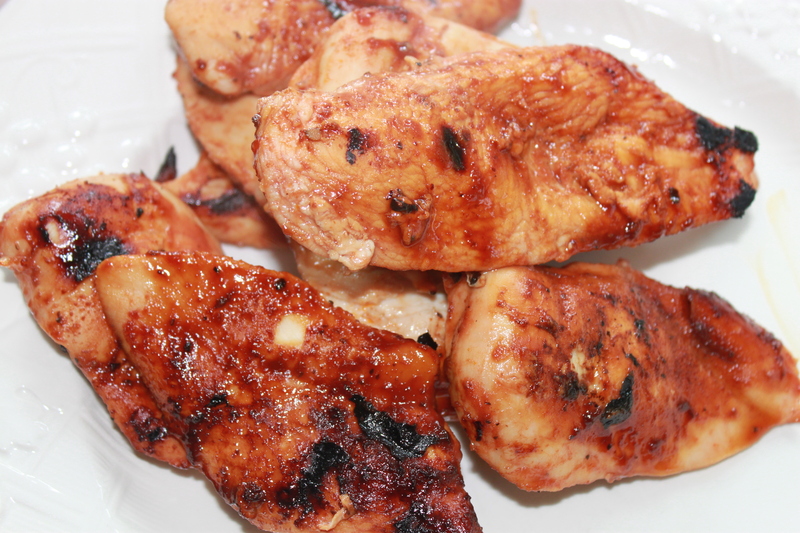 Grill with chicken for 5 mins. on High and 5 mins. on Medium. I boiled the corn because the kids don’t like grill marks on their corn. Boil for about 5-10 minutes. Try the new tool from Kitchen Capers that peels the corn off the cob for the kids (if they like that). Also, get the corn holders for the ends of the cob. What’s not to like about fresh corn with a little butter and salt? Tore pieces of Romaine and shredded a few carrots over the salad. Tossed with leftover Balsamic vinaigrette made the other night. 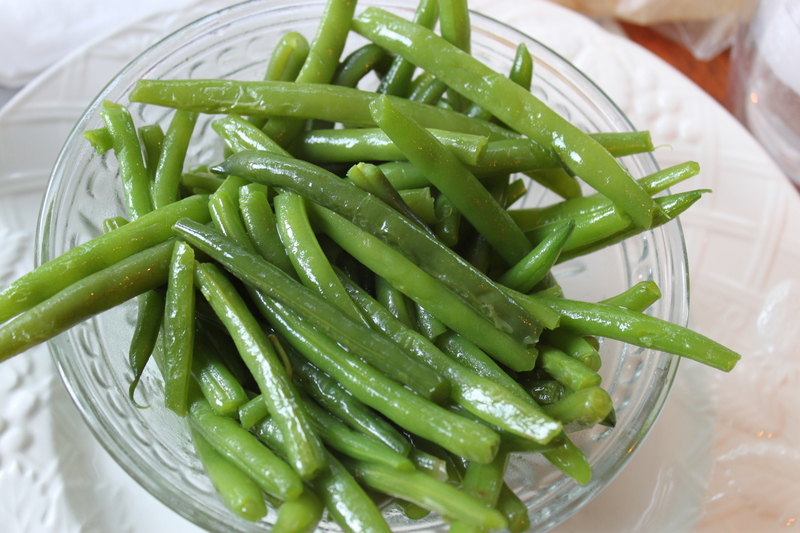 Help snap, cut with knife or use scissors to get ends off the string beans. Add ingredients and toss string beans (use hands). Teach how to (carefully) tear a piece of tin foil – depending on age. If young, teach about sharp edges. Help shuck the corn on the cob. Use hand grater to grate carrot into the salad. One bushel of corn will sweeten more than 400 cans of Coca Cola. Ice-cream, marshmallows and ketchup all have corn products in them. I cannot tell you how many smart, educated and all-together fabulous moms, who enjoy food themselves, succumb to the “short order cook” syndrome. If you are not familiar, this is the person who cooks something different for her spouse, each of the kids, and herself (if she has any energy left). This amazes me. 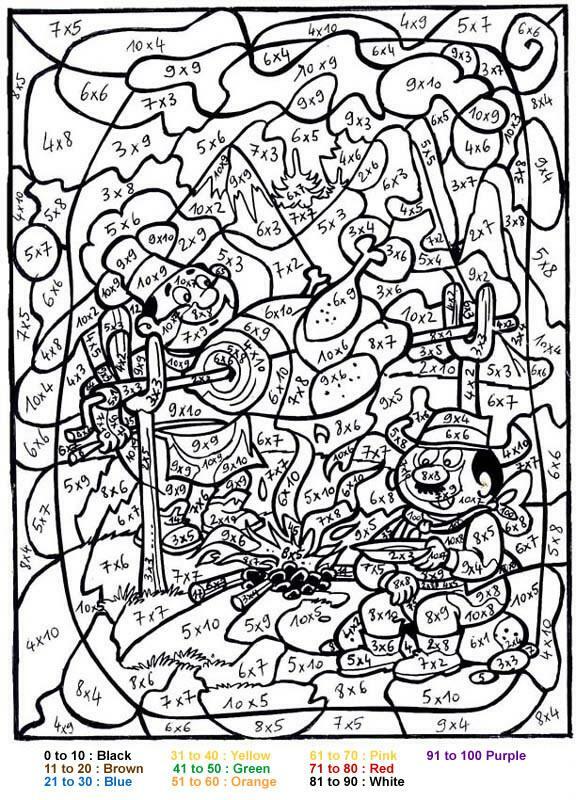 Did your grandmother do this? My favorite show growing up was Little House on the Prairie – I am pretty sure that Caroline Ingalls did not offer multiple choice dinner options. Bear with me, I am on a roll….do starving children in Africa or flood victims in Haiti turn away broccoli with melted cheese or sweet potatoes with brown sugar/butter. Hell no! Why? Because they don’t have the luxury and most likely, they are malnourished. However, isn’t it ironic that studies show that our children (with all the options in the world) are also lacking in basic nutrition? Sometimes, more choices do not result in a better outcome. The new American Dream – less is more, go figure. My kids weren’t feeling great so I cooked this soup in 10 minutes. It works with or without meat. Heat up 2 boxes of organic broth (I like to mix 1 chicken and 1 vegetable). Pour about 2 cups of pasta in the broth (I like the mini shells but whatever works). Slice some baby carrots and put them in the broth with the pasta and boil for about 10 min. (you can add any other veggies you have if you want i.e., celery, mushrooms). If you have some leftover turkey or chicken breast you can cut it up and add it in the last 2 mins. I sprinkled some parsley and a little black pepper on top for color (but skip if you want). Serve with some crackers or bread and of course, a big hug. Many of Campbell’s traditional red-and-white label soups, have more than 800 mg of sodium in a one-cup serving. That’s a third of a day’s sodium in a food that may only contain a twentieth of a day’s calories. A new study failed to find a link between a low-fat diet and the risk of coronary heart disease. The push to replace saturated fats with corn/soy products has backfired, as these trans fats are twice as bad and they are killing us. Western Diseases (obesity, diabetes, cardiovascular diseases and cancer) are linked to the Western Diet of highly processed foods and refined grains. Cultures that do NOT eat the Western Diet, do NOT demonstrate the same chronic tooth decay and disease. In 1973, the FDA overturned a law from 1938 that required food companies to label foods as “imitation” (even if they are). To get Omega 3’s in eggs, they force hens to each flaxseed (fish oil). There are 17,000 new foods introduced each year. Don’t eat food your great-grandmother wouldn’t recognize. Don’t eat food products that are a) unfamiliar, b) unpronounceable, c) more than 5 in number or d) have high-fructose corn syrup. Food with health claims on them aren’t worth eating (a banana doesn’t come in a box with a sign “high potassium” on the front). Drizzle some olive oil in a large pan. Chop and heat 1-2 cloves of garlic and heat in the oil. 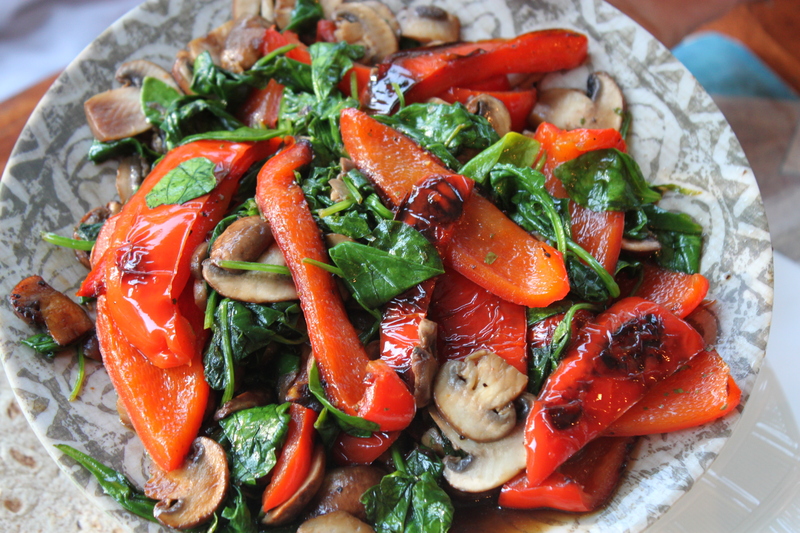 Sprinkle a few red pepper flakes for extra flavor. Note: Use 1/2 teaspoon of garlic powder if you prefer). Salt/pepper and cut 4-6 chicken breasts into bite-size pieces and brown in the oil. Boil pasta water and cook bite-sized broccoli florets in the water until cooked through. Use hand strainer to pull out broccoli. Reuse water to cook a little more than ½ pound of ziti (save some pasta water). 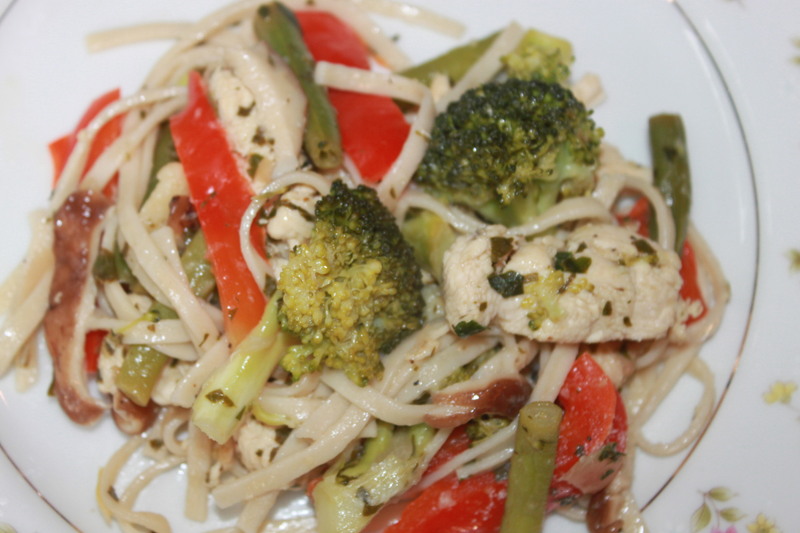 Add to pasta and broccoli to chicken in the pan. Add about a ½ cup of half & half (or milk or chicken broth), ½ cup of parmesan cheese and a juice from 1/2 lemon and stir. Sauce will thicken quickly. If using whole garlic, take it out now. Stir. Add a little pasta water if needed to thin sauce and serve with a little more grated cheese on top. Smash or peel garlic (after mom smashes to open). Add EV Olive Oil to the pan (pour until you count to 3). Help wash broccoli and cut into bite-size pieces (or tell Mom which pieces to cut). Help measure chicken broth and parmesan cheese. Roll the lemon to loosen juices and help squish juice in a bowl (get seeds out) or turn lemon upside down and let juice go through your fingers to catch the seeds. 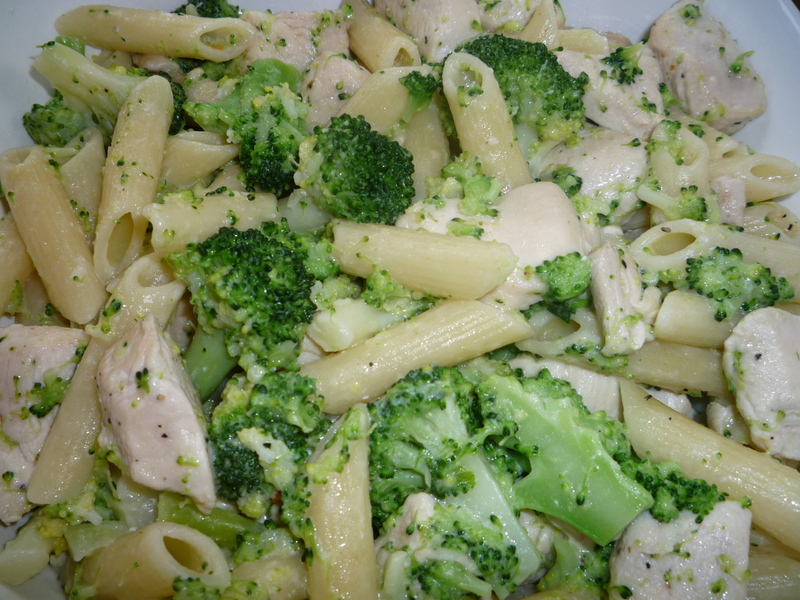 Chicken Ziti and Broccoli is a staple in Boston (especially in the North End) but is not nearly as common in Philly. Crops are shrinking to a few “high-yield” varieties (e.g., half of all broccoli grown commercially in the U.S. is a single variety due to its high-yield). The combination of eating broccoli and tomato together slowed tumor growth more than either one eaten separately. Better check-out my Chicken Tomato-Broccoli dinner! No summer was complete as a kid without a visit to my Great Aunt and Uncle in Brigantine, NJ. They were pretty old – Aunt Anna was all hunched over and hobbled around (she shrank every summer) and Uncle Joe could barely hear. One night little Aunt Anna insisted on making dinner for everybody (probably 15 of us) to show us that she was still capable. We all sat down and of course began complimenting Aunt Anna on her food profusely, “this food is the best….terrific…. wow this food is FANTASTIC!”. Uncle Joe yells out “HUH, WHAT are you talking about? This food’s not PLASTIC!”. Remember that uncontrollable laugh you had in 6th grade when your best friend farted in class? That’s what followed. 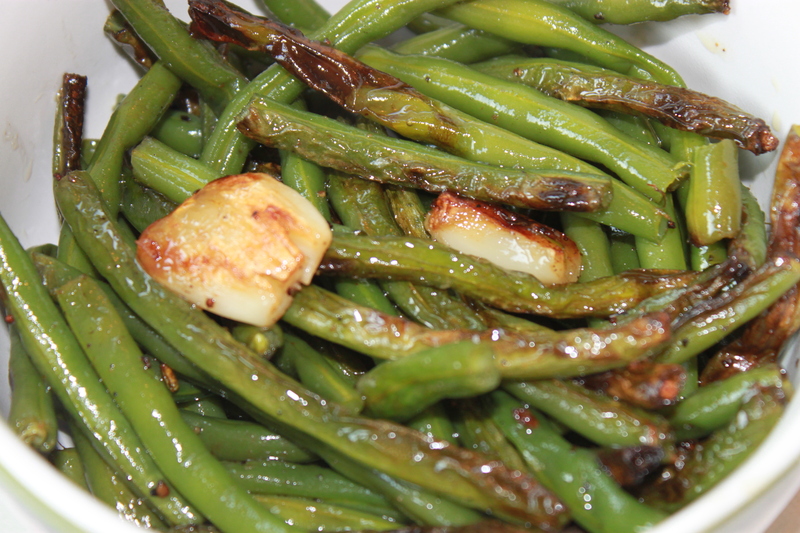 You can make this dish with any veggies you like. Put the chicken, cheese and veggies on the side and let everyone make it the way they want. Worst case the kids eat the chicken and cheese on the tortilla. Sautee garlic in a little olive oil in a large pan and cook 1-2 sliced red peppers. Add some spinach and mushrooms and a dash of salt/pepper. Peppers take longest to cook so I cooked them first. You can keep veggies separate for picky eaters to pick/choose. Move veggies to a serving dish and cover with tin foil. Take out garlic and reuse with chicken. Clean and cut 4-6 chicken breasts into strips. Cook chicken in a drop of olive oil and garlic and add salt/pepper. Move to a serving dish. Heat (wheat) tortillas separated in tin foil for a few minutes. Mayotard: Mix 5 TBS of mayo and 3 TSP of mustard together to spread on fajita. If I can’t wait for my potatoes to cool I make them this way. The potatoes aren’t in perfect squares (they are a little mashed) but they taste delicious! Cut 6 red potatoes and cook in salted boiling water. Drain. Chop some celery (I like to peel it first) and 1 shallot and add to the potatoes. Add the mayotard and stir. Mix in salt/pepper and some tarragon (or parsley) if you like. Put in fridge to marinate a bit or serve right away. Boil some string beans in about an inch of salted water. Cook until done and drain. If not serving right away, run under cold water. Return to pot and heat with some whole garlic cloves and salt/pepper and a drop of EV olive oil. For added flavor you can also toss with some chopped basil and/or cherry tomatoes. 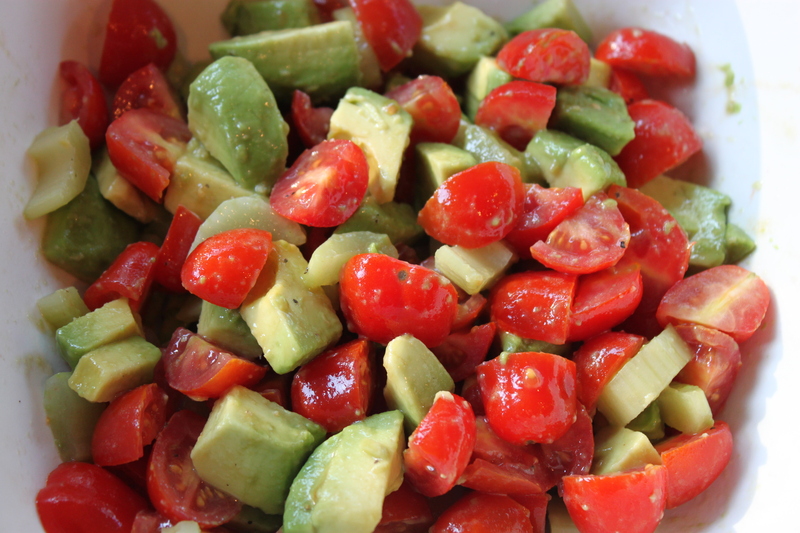 Cut avocado into cubes and cut grape/cherry tomatoes in half. 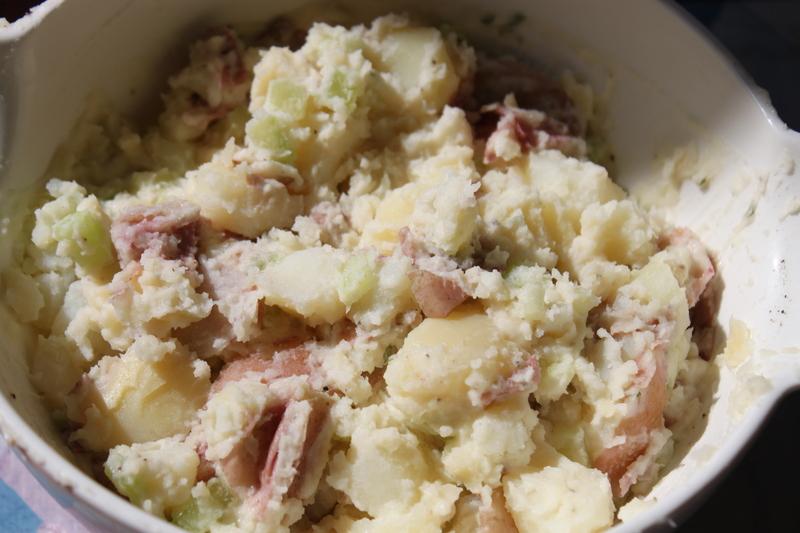 Add celery if you have it (from potato salad). Toss with a little EV olive oil and vinegar (red wine or rice wine vinegar). Help pick what veggies to cook for the fajitas. Should they be cooked together or separately? Peel the garlic clove after mom ‘smashes’ it with the back of a butcher knife. Cut some of the celery into sticks for the kids to snack on. Snap or cut or use scissors to snap ends of string beans off. 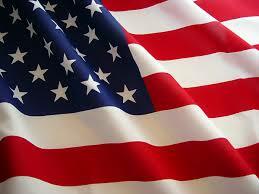 Fajitas were first created in the Rio Grande Valley of Texas. They were served to cowboys on the ranches but were not served in a restaurant until 1969! A very sweet older couple in our neighborhood invited us over for dinner when we moved into our house years ago. We arrived (hungry of course) and saw 3 of the smallest bowls of salads I have ever seen on the table for dinner. We sat around commenting profusely on how lovely and delicious it looked. We sat down and all took tiny portions as not to empty any of the bowls. As you know, there is an unwritten rule never to take the last serving of food when you are in a group. We were all so afraid to eat that there were tons of leftovers. It was a modern day loaves and fishes miracle. If you were at the dinner table with my mother and nobody was eating the last piece of food on the plate, she would say with attitude, “What, are we going to POSE with this piece of chicken?!”. Most times people would rather leave food on the serving dish (to be thrown away) than take the last portion. This was true at my pizza party on Friday night. The kids ate so much pizza that there were only 7 slices left for 5 adults. What happened? There were still 2 slices left after dinner. I guess my mom was right….smile for the camera! 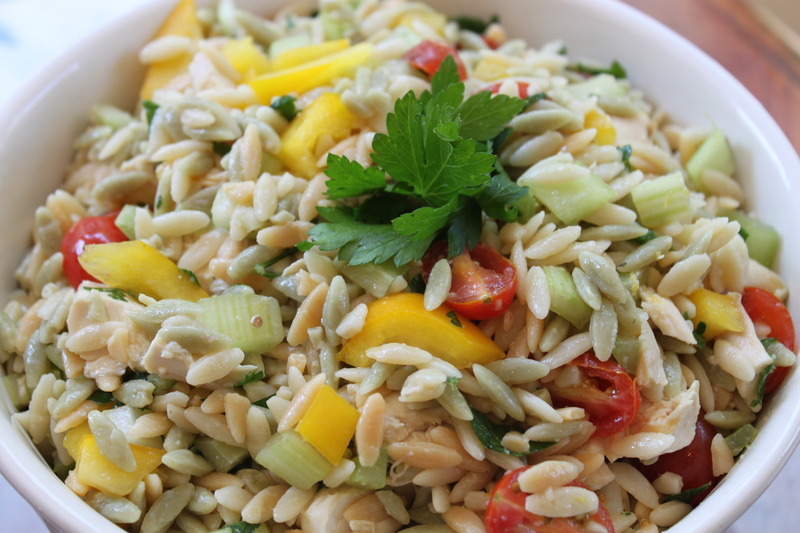 Chicken Orzo Salad: Grab a rotisserie chicken for this recipe. I like to use mostly just the breast but you can use it all or save the dark meat for chicken salad. Use a butcher knife to cut chicken into pieces (gives a cleaner cut). Cook 2 ½ cups of orzo. Drain (drip a little olive oil on it so it doesn’t stick together). Cup up 1 rotisserie chicken (chunky bite-size) and place into large bowl. Vinaigrette (use a small jar to mix): Mix ¼ cup of red wine vinegar, 1 tsp mustard, lemon juice (1 lemon), 1 tsp honey. Add 3/4 cup of EV Olive oil and salt/pepper — Shake! Cut up orange pepper into slivers and toss into big bowl of salad (baby romaine/mixed greens). 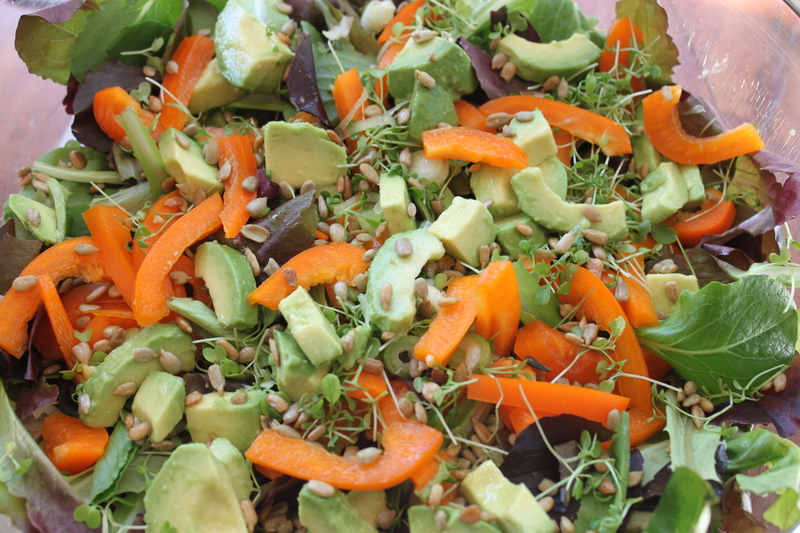 Sprinkle sunflower seeds on salad. Toss some sprouts on top. Use vinaigrette from Chicken Orzo and mix all together. Let them watch you take the chicken breast off the bone and explain about white and dark meat. Ask them to try both and tell you which they prefer. The University of Texas Cancer Center found that cancer cells were “99 percent inhibited” by the mix of live sprouts (mainly broccoli seeds). How’s that for a positive link between food and cancer? Nuts and seeds have high levels of essential fatty acids. These are good fats and when eaten in moderation will help you lose weight!